Only seven teams in the Minor Leagues have managed to turn a triple play in 2018. Double-A Springfield became the first to do it twice. 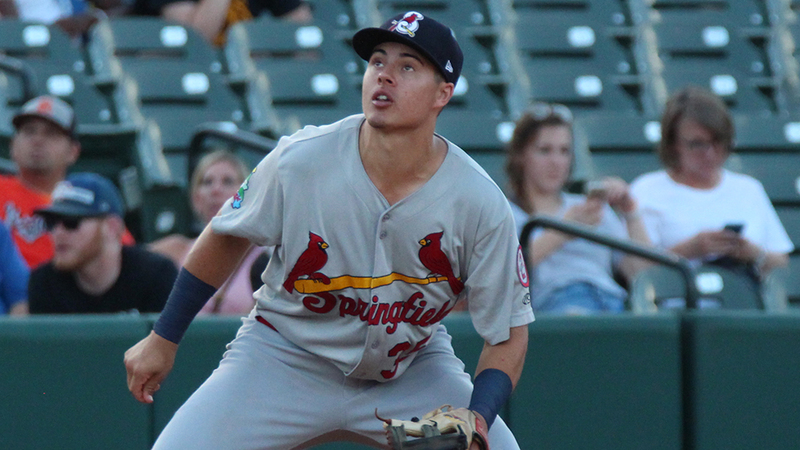 The Cardinals cleaned up the bottom of the sixth inning with an around-the-horn triple play before falling to Midland, 4-1, on Sunday at Security Bank Ballpark. It was the third turned in the Texas League this season. After scoring a run in the top of the fifth to get within 3-1, Springfield's Ramon Santos replaced reliever Austin Sexton to begin the sixth. The right-hander gave up an infield single to Santiago Chavez and walked Tyler Ramirez. After a mound visit, Santos got Edwin Diaz to connect on the first pitch, sending a grounder to third. Cardinals No. 28 prospect Evan Mendoza scooped it up and stepped on the bag before flinging it to Ramon Urias at second. He relayed to Chris Chinea to complete the fourth triple play in team history. For Mendoza, it was a professional baseball first, but one he said he's been mentally training himself for ever since he can remember. The Cardinals' 11th-round pick in the 2017 Draft said he immediately recognized the potential to turn three once the ball rocketed off Diaz's bat. "It was a really quick, hard-hit ball. Just a one-hopper right to me," he said. "I rushed to the bag to try and give it a chance, and when you have a hard-hit ball and a slow runner, you've got a chance. "Ever since I was a kid, I knew you had to anticipate what to do with the ball in every situation. I saw it in my head, exactly what we had to do, and it came true." Mendoza thought back to another triple play he helped turn as a third baseman at North Carolina State during a scrimmage, in which runners on first and second attempted a double steal. There, he snagged a grounder hit right to him at third and capitalized on his opponents being in the wrong place at the wrong time. Sunday's triple play, he said, was harder to execute. "There are a lot of things that have to go your way," he said. "If the grounder was just a few feet more to the left, it's a much harder play to make possible. A lot has to go right." Although Springfield failed to capitalize on the energy shift at the plate in the final three trips up, Mendoza said he could feel the attitude in the dugout change after his teammates jogged off the field at the end of the sixth. It was a perfect example of how games have the potential to change in a snap. "It gives you the momentum, but you have to execute in your at bats," he said. "But it showed that in a single half-inning of baseball, one single play can really turn a game. Today, it didn't because we didn't capitalize on the moment, but it really fired up our clubhouse and brought us some hope in that game." It was also the second time this season Midland hit into a triple killing. Frisco went around the horn against the RockHounds on June 17. As in that game, Midland shrugged off the milestone as Seth Brown padded the lead with a sacrifice fly in the eighth. J.P. Sportman put the RockHounds on the board in the first with a two-run homer and Tyler Marincov drew a bases-loaded walk in the second. The lead was enough for starter Parker Dunshee (1-1), who gave up a run on three hits with seven strikeouts over six frames.